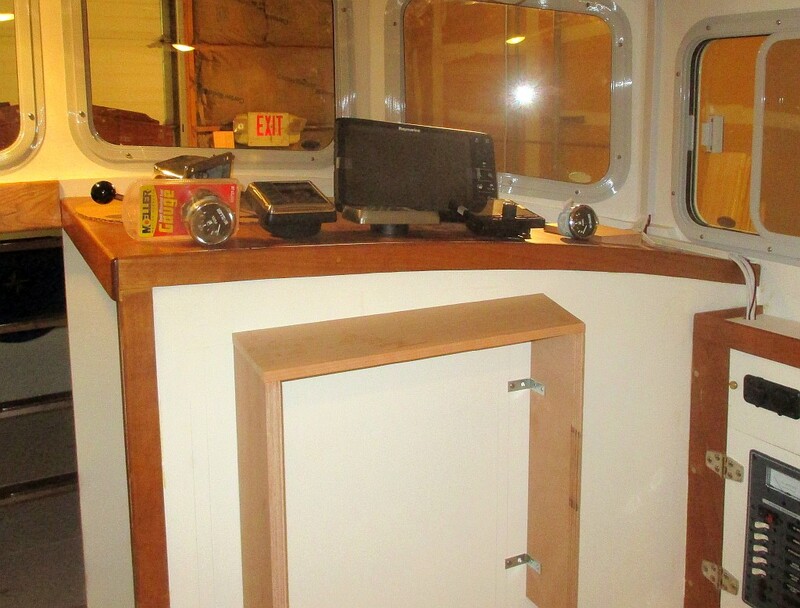 I was down on my knees with a drill at the deckhouse helm station just about to make a series of holes that I really didn’t want to make when Ray walked in with a recalcitrant tool and saved the day. 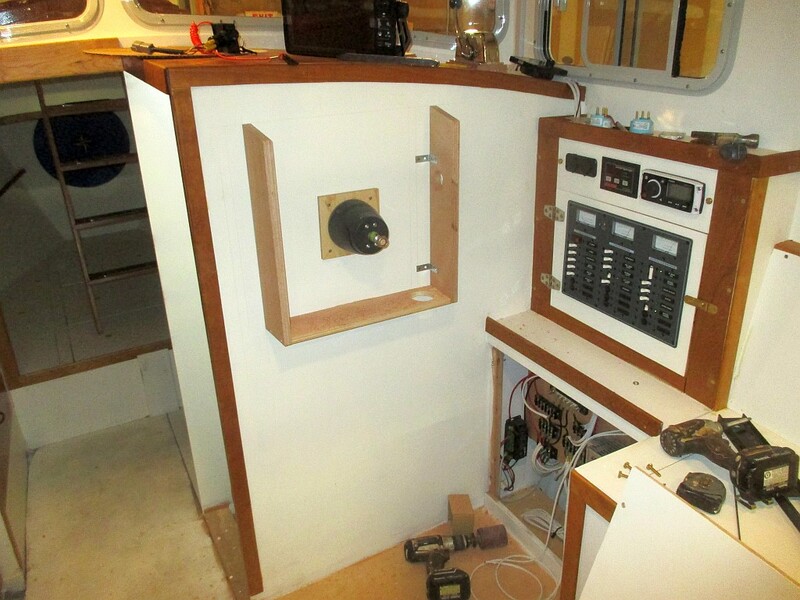 I have been working away steadily on the engine controls and steering — the last big installations before E-Tec time. The control situation is more complex than I thought it would be. I really need two helm stations — the main deckhouse station and a secondary helm in the cockpit for docking and mooring. But the controls for these stations need to be daisy-chained together and work simultaneously. That means they have to be exactly the same type of control or they will fight one another and not work smoothly. 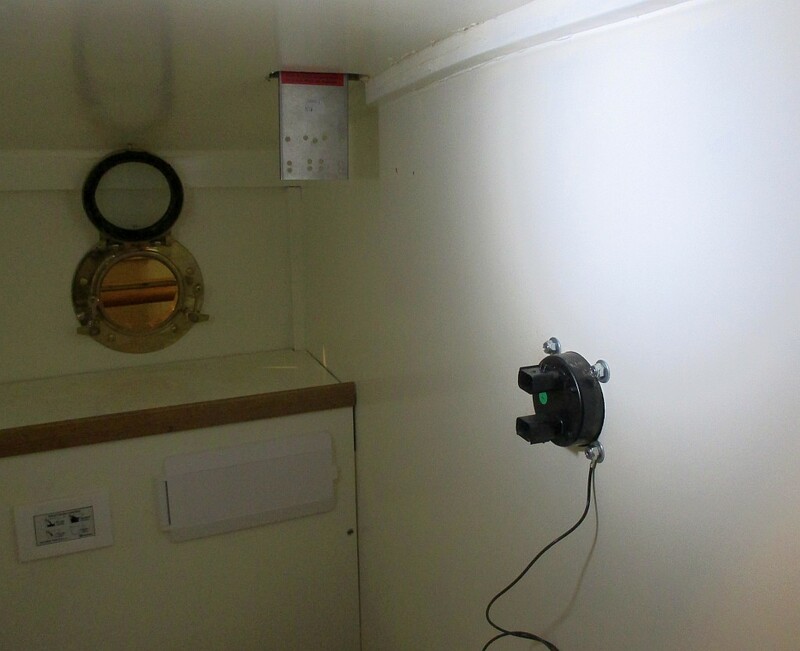 The cockpit control had to be a “binnacle mount” with vertical cables running down under the deck, so the deckhouse control had to be the same type. But there was no good place to put it. 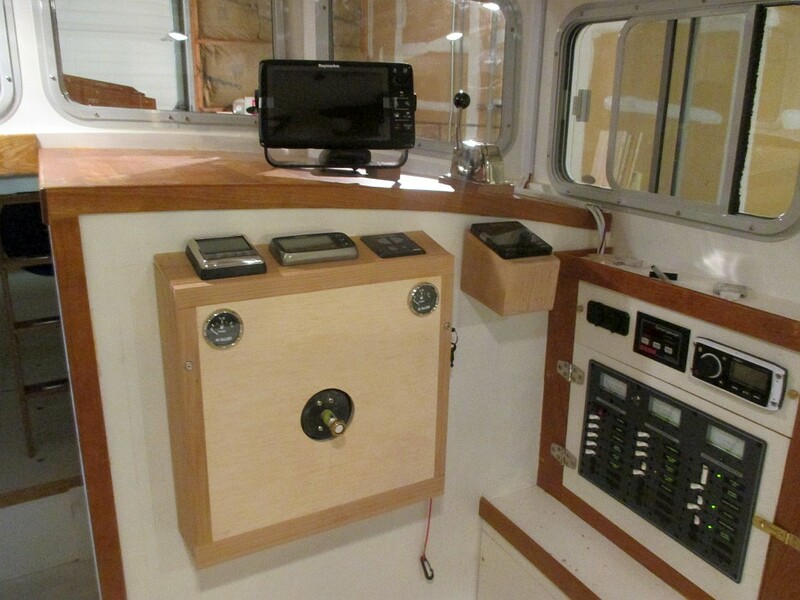 I thought about it for a couple days and decided to build a box next to the helm console, but it would look ugly, stick out into the deckhouse 10 inches and interfere with smooth operation of the circuit breakers. Ray looked it over and pointed out that 1) a binnacle mount should probably mount on the binnacle — the area in front of the wheel that forms the head ceiling; 2) the control cables could be routed behind the toilet through the box that forms the back wall; 3) even if this was a little too far from the wheel, all the heavy shifting would be in the cockpit and this would pretty much be a speed control. I later figured out that I could mount the handle on the side closest to the wheel, so I put the binnacle mount on the binnacle where it feels and looks just right. 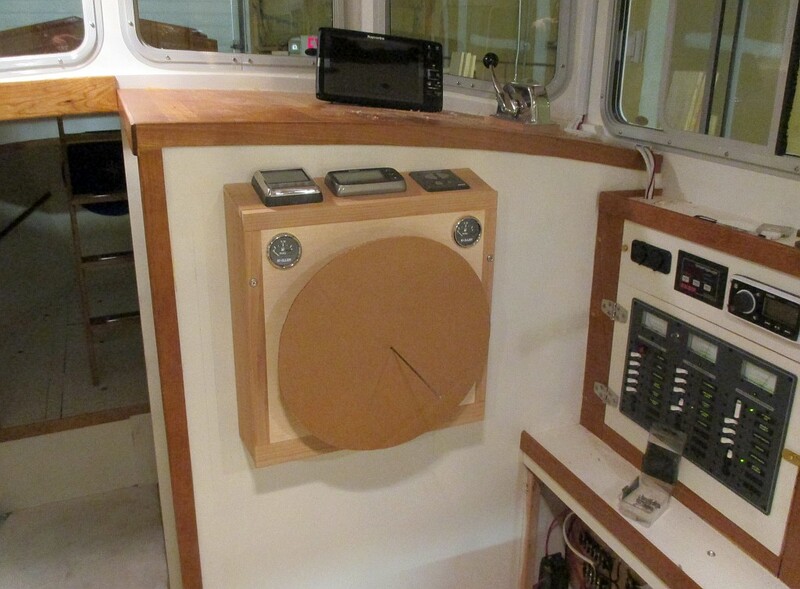 It was a jigsaw puzzle getting the steering control, depth sounder, bow-thruster control, autopilot control, fuel gauges, helm, chartplotter and engine controls located correctly, but eventually it all came together. The autopilot control is much bigger than the other instruments and needed its own box which looks a little funky, but pretend-driving with the cardboard wheel feels pretty good and all the controls are easy to reach. Cockpit helm station. 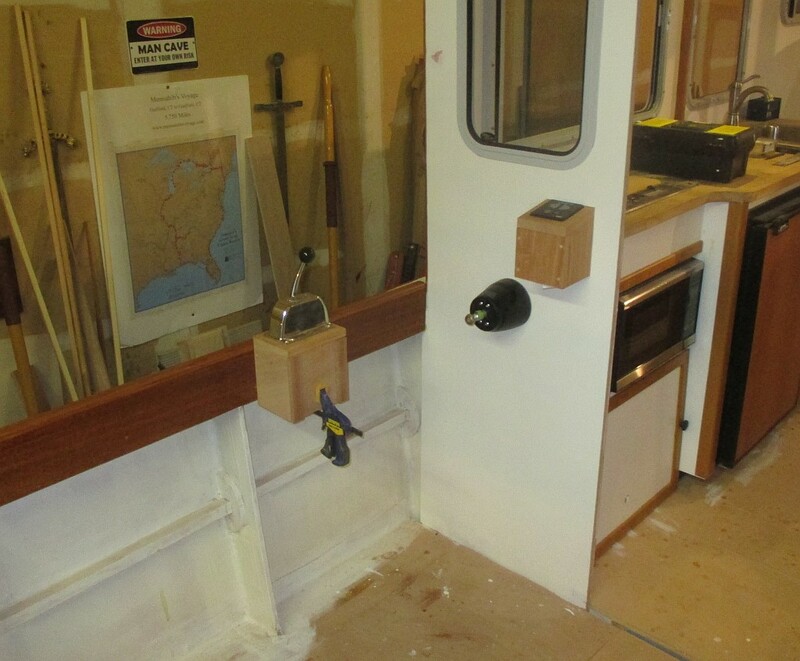 Bow thruster control is in the little box. Dear Paul: Although I am a faithful reader of the Tardis epic, you’re wearing me out. When will you launch this meticulously crafted craft>. Where? Also, if memory serves — and mine often doesn’t these days — weren’t you and Molly scheduled to do some traveling when she recovered from the hip operation? Did go? Where? I’ve been following your Tardis project with great interest for a couple years now. I have a similar love for the Dreamboat economy and lines. (Here in Seattle we are lucky enough to still have a few on the water.) Some time ago I prevailed on Mr. Smalters for a copy of the Olga study plans, and for some reason I can’t seem to shake the ambition to build it. As luck would have it, I have need to be in southern CT on business next month, and I’m wondering if you could spare any time at all to meet with me and perhaps talk me out of it. I have some experience with the construction techniques and a fair amount of the right tools. I feel like your experience would be invaluable, even if briefly. Please do me the favor of a reply.